President William L. Fox ‘75 applauds as the Rev. Peter J. Gomes, rector of Memorial Church at Harvard, is hooded by University marshals Aileen O’Donoghue and J. 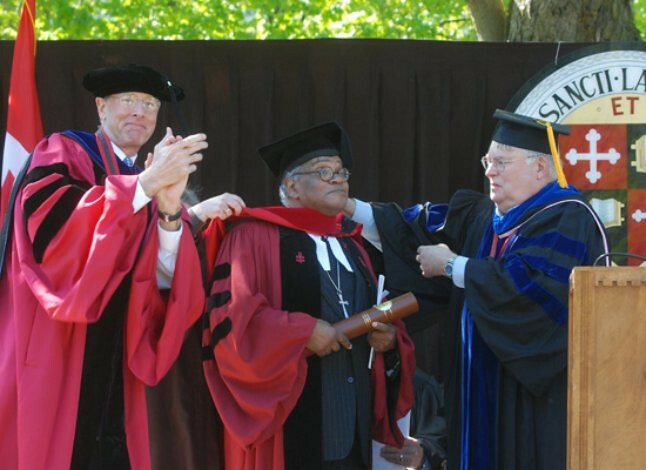 Mark Erickson after receving an honorary doctor of divinity degree honoris causa at St. Lawrence University’s 150th Commencement in May 2010. Gomes died on Monday. Image taken by Tara Freeman, University Photographer. The passage of the Rev. Peter J. Gomes, longtime Pusey Minister of Harvard’s Memorial Church and Plummer Professor of Christian Morals at the School of Divinity, is worth noting here. Mrs. F. alerted me to his passage just after I arrived at work this morning. Gomes died Monday at Massachusetts General Hospital from complications of a stroke he suffered in December. He was 68. You can download — and I strongly recommend you do download it — Gomes’ speech here. Indeed, he was terribly stylish. All of us who attended last spring’s commencement remarked on his appearance — watch fobs, three-piece suits, circular, tortoise eyeglasses. Remarkable. He received his degree in Harvard’s crimson robe, a tailed Roman collar and a pinstripe suit. But far more important than that, Gomes was substantive. He was a member of the sadly dying breed of flamboyantly brilliant American public intellectuals. He was deeply complicated. He made waves in the early 1990s when he came out of the closet. As a child, he was convinced that he was a descendant of the Pilgrims — much of his scholarship was devoted to the beginnings of Yankee culture. He was a staunch Republican who delivered the benediction at Ronald Reagan’s second inaugural but broke with his party late in life to support Massachusetts Gov. Deval Patrick. And he believed the story of Christian faith was ever evolving. 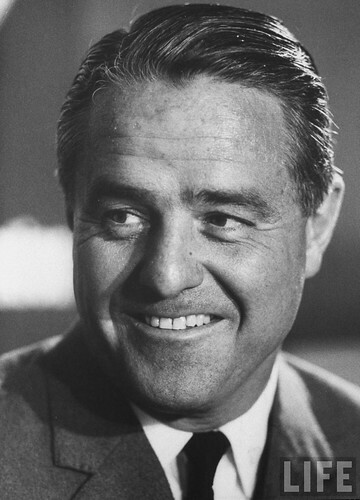 Rober Sargent Shriver Jr. in the mid-1960s. Robert Sargent Shriver Jr., a giant of the New Frontier and the driving force behind the creation of the Peace Corps, has died. He was 95. Born in Westminster, Md. on Nov. 9, 1915, Shriver was a scion of one of that state’s oldest families. His ancestor, David Schriver, signed Maryland’s constitution in 1776. Educated at Canterbury School in New Milford, Conn., Shriver was graduated from Yale in 1938. While in New Haven, he was chairman of the Yale Daily News, a member of Delta Epsilon Kappa and of Scroll and Key. 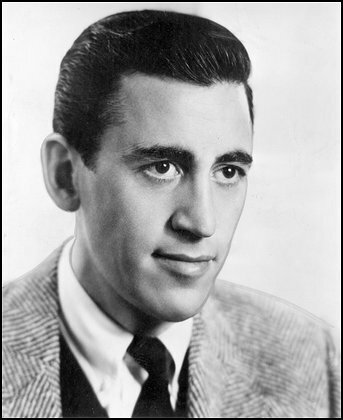 He went on to earn a law degree from Yale in 1941. During World War II, Shriver served in the U.S. Navy, rising to the rank of lieutenant. Returning to civilian life, he became an editor at Newsweek. He met his future wife, Eunice Kennedy, in 1946 and was subsequently hired by her father, Ambassador Joseph Kennedy, to help manage Merchandise Mart in Chicago. Shriver and Kennedy married in 1953 in a service performed by Cardinal Francis Spelman at St. Patrick’s Cathedral. The Shrivers called Chicago home and Mr. Shriver dove into Democratic politics, so much so that he was considered as a candidate for Illinois governor in 1960. 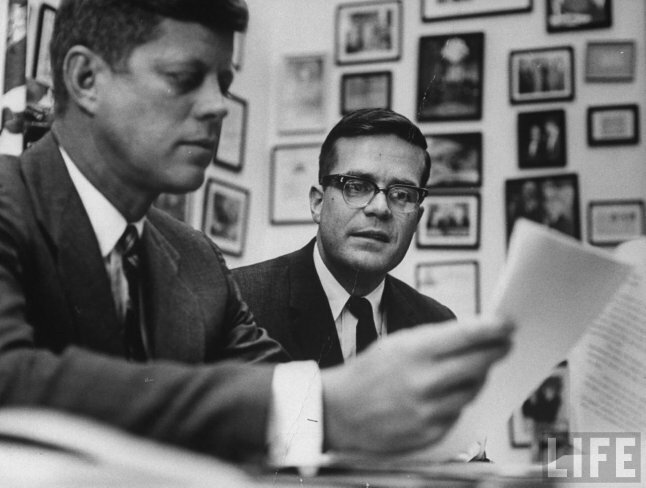 Those plans were dashed by the presidential candidacy of his brother-in-law, John F. Kennedy. Shriver joined the campaign and, after the election, set about designing and then administering the Peace Corps, created by an executive order in March 1961. Shriver led the Peace Corps into the Johnson administration and went on to design President Johnson’s War on Poverty. 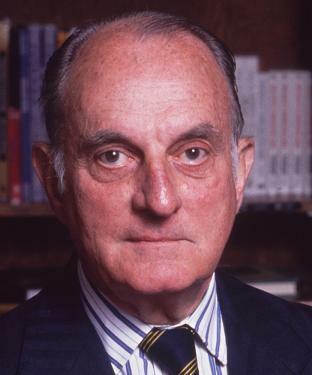 He later served as Ambassador to France from 1968 to 1970 and was the running mate for the doomed presidential candidate George McGovern in 1972. His own presidential run in 1976 lasted only months. In retirement from political life, Shriver was active as an attorney and as chairman of the Special Olympics. He was diagnosed with Alzheimer’s disease in 2003. His wife, Eunice, predeceased him in 2009. Mr. and Mrs. Sean R. Milligan, minutes after their marriage on Saturday, Sept. 11 at the Church of the Incarnation in Murray Hill. We spent the better part of last weekend in Manhattan celebrating the marriage of very dear friends. 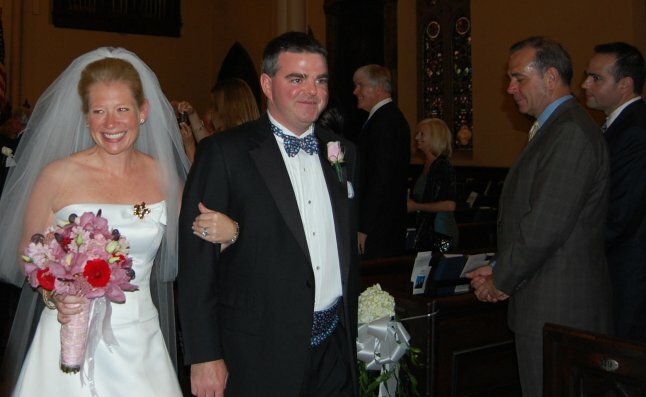 Molly McLaughlin was wed to Sean Milligan at the Church of the Incarnation in Murray Hill by the Rev. J. Douglas Ousley, the church’s rector. The Rev. Donald S. McPhail, a close friend of the bride’s family and past rector of St. Peter’s-by-the-Sea Church in Bay Shore, New York, took part in the ceremony. Molly and Sean, not surprisingly, are very good St. Lawrence friends. I had the privilege of serving as an usher and Mrs. F. was in charge of getting the male members of the wedding party set with their boutonnières — something Molly had done for us when we got married. Church of the Incarnation is a Victorian marvel and was the perfect site for this wedding. There was an undeniable majesty to the service that was amplified by beautiful stained glass, sculpture and architecture. A fabulous reception followed at the New York Athletic Club. As I remarked in a toast I gave to the bride and groom, it was deeply appropriate that the room we celebrated in faced north, out past the lights of our resilient city, toward the place where the Milligan romance was born. Here’s a gallery of photos from the weekend, which includes a few shots from the Friday night reception hosted by the groom’s father, Charlie, at The Water Club. 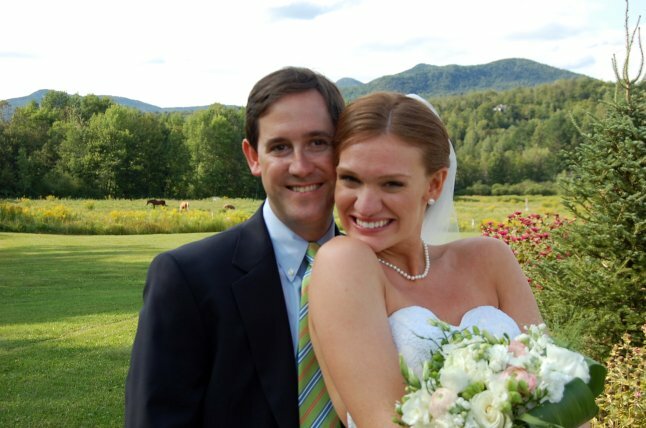 Mr. and Mrs. Timothy P. Furnary, minutes after marrying Saturday afternoon in Stowe, Vt.
A wonderful pair of very close friends exchanged vows to one another on a meadow just below Mount Mansfield last Saturday afternoon. Lindsey Wetmiller was wed to Timothy Furnary by the Rev. Susan Cooke Kittredge in a lovely ceremony at Topnotch Resort in Stowe, Vt. Mrs. F. and I were both in the wedding party and I had the privilege of standing up as Tim’s best man. Countless Laurentians were in attendance and another member of the wedding party who went to St. Lawrence had the good sense to hang one of our scarlet-and-brown flags above the bar. We used another, larger flag that belongs to me, for the St. Lawrence magazine photo. My flag has been present at nearly a dozen Laurentian weddings and I hope it gets use at dozens more. Stowe was chosen because the bride grew up in Vermont and the groom learned to ski in the Green Mountain state. The whole weekend, though — from the Friday welcome reception thrown Friday night by the groom’s parents at the Stowe Mountain Lodge, to the fantastic groomsmen’s lunch we had at Norma’s, Topnotch’s swell restaurant, to the morning-after brunch at the iconic Shed restaurant — was a hoot. We had a terrific time. A great many thanks to Mark and Melody Wetmiller, parents of the bride, for being such gracious hosts. The Furnarys are honeymooning in Italy, visiting Rome and the Amalfi coast among other destinations. They’ll reside in New York. Here’s a gallery, with thanks to ejforbes.com contributor Will Briganti for manning my lense during and just after the ceremony. Thomas P.F. 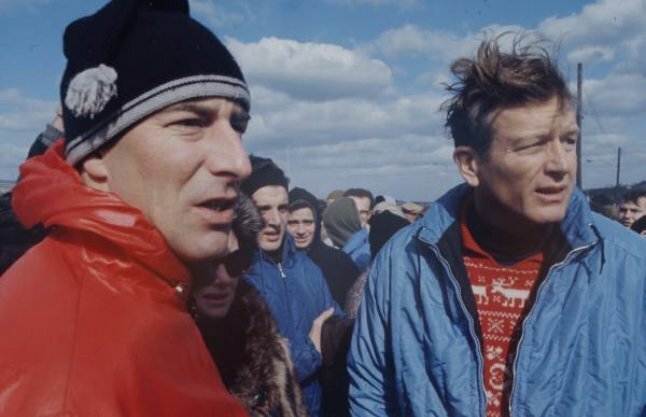 Hoving chats with Mayor John Lindsay during a walking tour of one of New York’s parks in 1966. Hoving erved briefly as Lindsay’s parks chief before assuming the reins of the Metropolitan Museum of Art. Thomas Pearsall Field Hoving, the groundbreaking director of the Metropolitan Museum whose reign secured its place as the nation’s greatest museum, has died. He was 78 and suffered from lung cancer. Born in Manhattan Jan. 15, 1931, Mr. Hoving was educated at Buckley, Eaglebrook, Exeter and Hotchkiss. 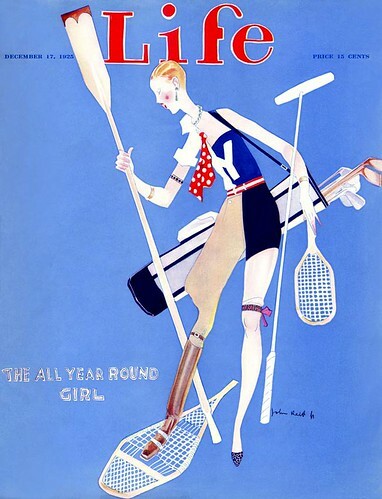 After Hotchkiss, he worked as a copy boy for the late Daily Mirror. He was graduated from Princeton in 1953 and he later earned both a master’s degree and a doctorate in art history. He earned a master’s, then a doctorate, in art history at Princeton. Then, in 1958, after a lecture he gave at the Frick Collection on the Annibale Carracci frescoes at the Farnese Palace in Rome, a man he didn’t recognize and who didn’t introduce himself invited Mr. Hoving to take a walk up Fifth Avenue to the Met to see a marble table that had once graced the palace. The man turned out to be James J. Rorimer, the Met’s director, who offered Mr. Hoving a job. Mr. Hoving remained at the Met until 1965 when, upon the election of John V. Lindsay as the city’s mayor, he was named parks commissioner. His stint at Parks was short — when Met director James Rorimer died in 1966, Hoving was named his replacement. Hoving’s run at the top of America’s greatest art institution was transformational. A character whose existence could only have been possible in the lost New York he inhabited, Hoving vastly expanded the collections of the museum. He landed the Temple of Dendur, an entire prairie-style house designed by Frank Lloyd Wright, expanded the American wing, added collections of Islamic, African and Pacific art and more. Hoving was a hero for all of this in my household, wherein my mother never ceased to sing his praises. “King of Confessors,” the director’s 1981 memoir about the museum’s acquisition of the Bury St. Edmunds cross, a Medieval ivory masterpiece and other treasures, was required reading for her son. A hero of Old New York, he will be greatly missed.